Rather than use johnnyc.net for class, we've created a new Live-In blog. We'll be sharing class research resources and findings there. There are numerous weekend events coming up soon that tie directly into understanding and celebrating the early history of the area. Trailnet's calendar says that a replica Lewis and Clark dugout will be on display at the Old Chain of Rocks Bridge as part of Eagle Days on January 19-20 from 9:00 am to 3:00 pm. For the community minded among us, Trailnet is looking for volunteers to help out with the Eagle Day events. What: The 22nd Annual Fete du Bon Vieux Temps (Festival of the Good Old Days) is a colonial Mardi Gras with music and dancing reminiscent of the celebrations held by the area's early French Settlers. From 2 p.m. to 5 p.m., various activities, demonstrations and tours will take place at the 1740 Cahokia Courthouse, 1790 Martin-Boismenue House, 1799 Holy Family Parish Log Church and the 1810 Jarrot Mansion. Time: 2 p.m. to 5 p.m.; Mardi Gras Ball, 7 p.m. to 11 p.m. According to the Fort de Chartres calendar that same weekend, February 2 and 3, at Fort de Chartres is a French and Indian War Assemblage. On March 15 and 16 there will be an American Longrifle Association Encampment. On April 5 and 6 the fort hosts the Colonial Trade Faire and Musket Frolic and on April 26 and 27, the Ecole de Soldat (School of the Soldier). 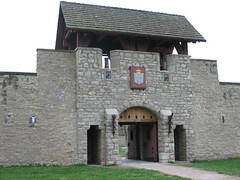 In May the fort hosts a Kids' Day on the 3rd and the Fort Massac Frolic and Event on May 10 and 11. Thanks to my friend Lynn, who left a comment on this blog, here is a link to a calendar of events taking place in and around Ste. Genevieve that celebrate the French Colonial period. Of note there, the King's Ball is taking place as it has for 250 years in Ste. Genevieve on February 2.